Yesterday afternoon, I had the pleasure of visiting my friend Robin's wonderful estate, the Humbolt Mansion, here in Springfield. 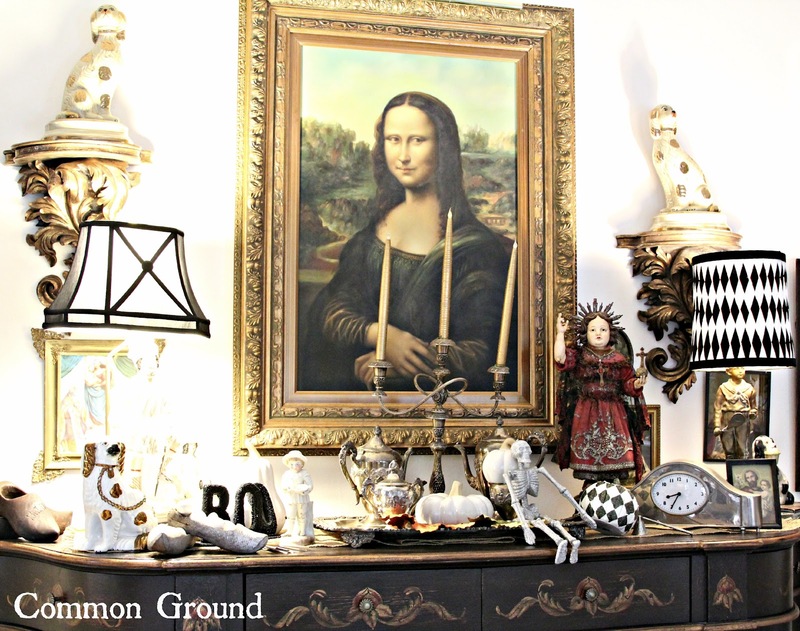 Robin is the creator and owner of Robin's Vintage Suitcase, the Vintage Veranda Tea Room, and Ms. Gilmore's, a wonderful wedding venue. 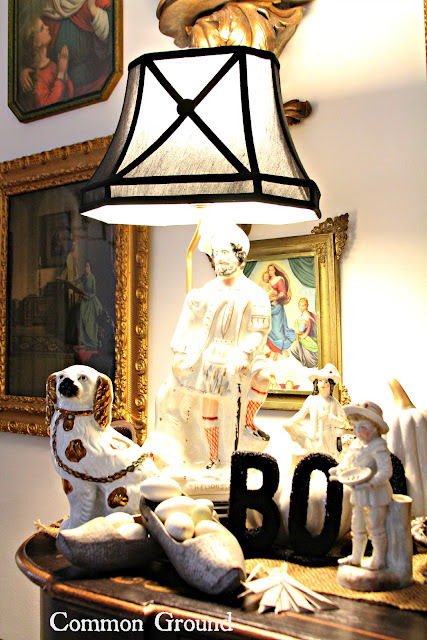 Robin and Rick's amazing 100+ year old home is a landmark here, and they are owners and caretakers of one of the most amazing homes and properties in the area. Robin's touch is evident at this fun time of the year, as she mixes antiques and one-of-a-kind collectibles with items she currently sells in her shop. 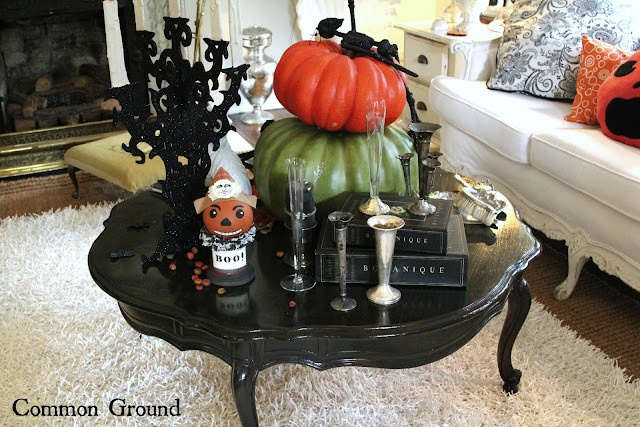 These are just a few photos of her home impeccably dressed for a "Haute Halloween". 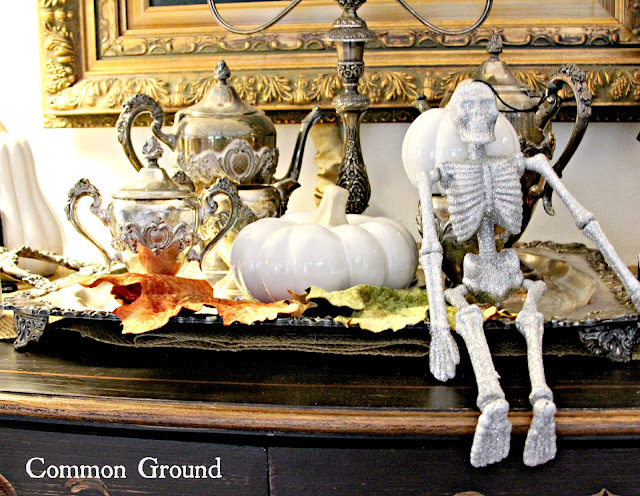 This is just the first post of wonderful Halloween inspiration. I'll be sharing more photos soon. love her fun Halloween decor! 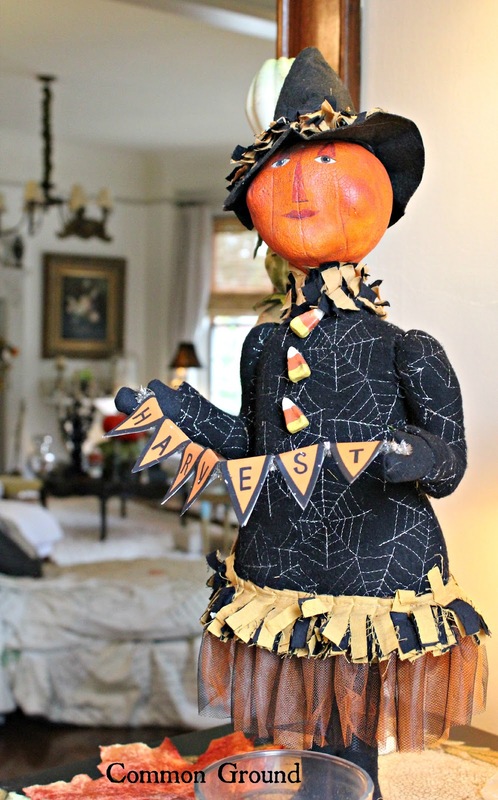 I'm about to pull out the Halloween decor this weekend, and this was great inspiration to get me in the spirit! 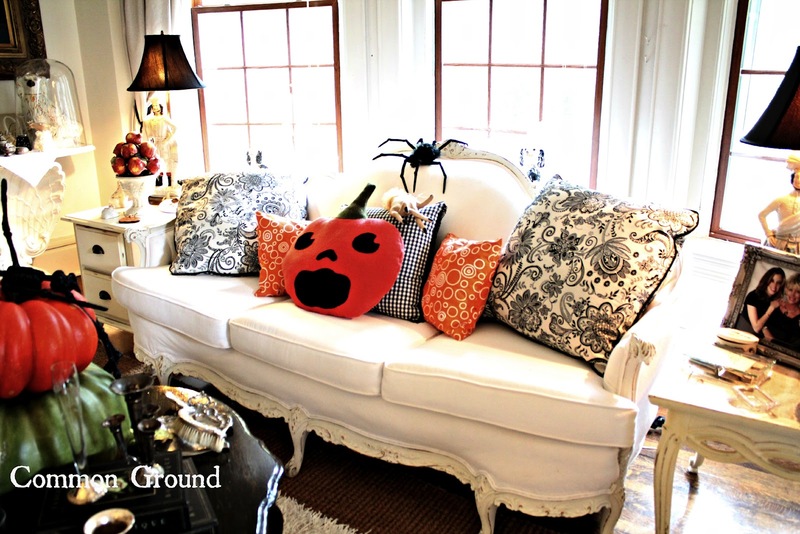 Wow... what a gorgeous home and loving her haute Halloween! The zipper mouth kitty is too cute and I love the pumpkin vines on the mantle... very cool. Such a fun time to decorate! 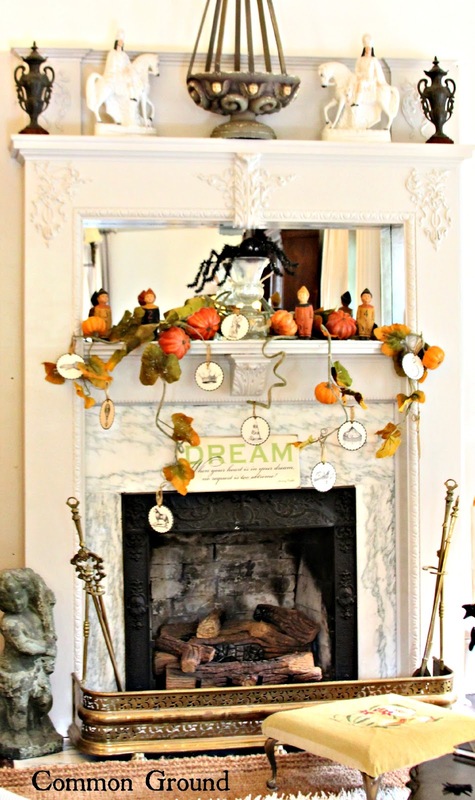 Love the viney pumpkin garland on her mantle...all her wonderful touches, just enough. Beautiful! Thanks for sharing.. I found great mantle inspiration! Wonderful photos! Thanks for sharing them. 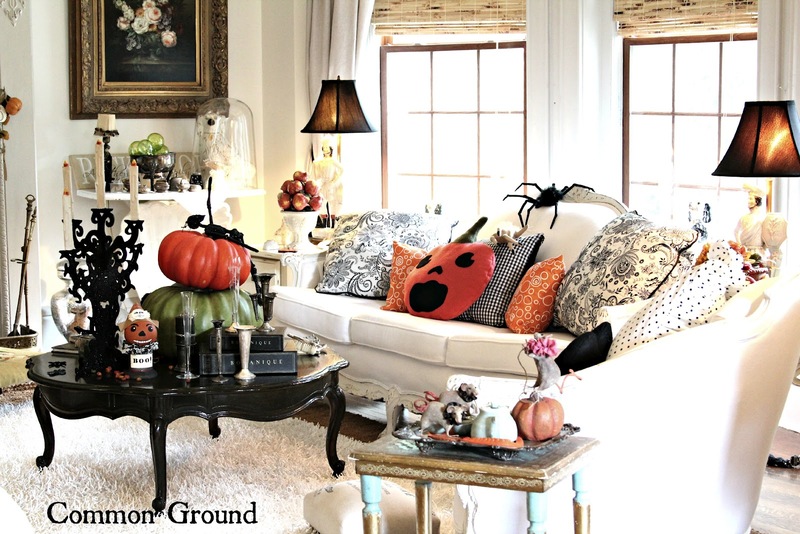 This makes me want to get busy decorating for fall. The sofa is a Scream with the giant spider. That is a magazine shoot room I tell ya. How cute. I love these pictures. 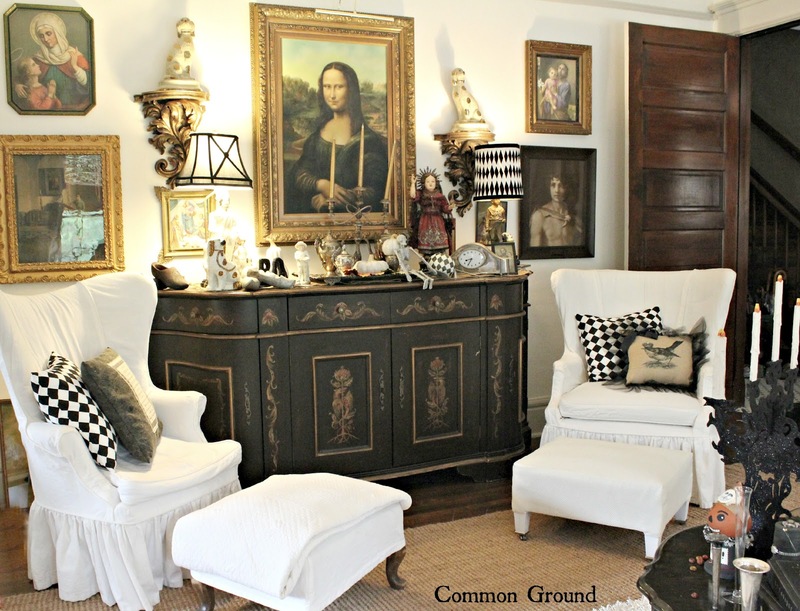 What a divine living space. 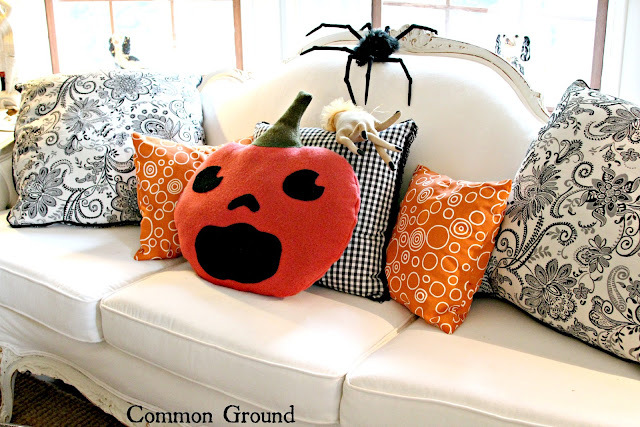 I absolutely love that huge pumpkin pillow and must have one now. 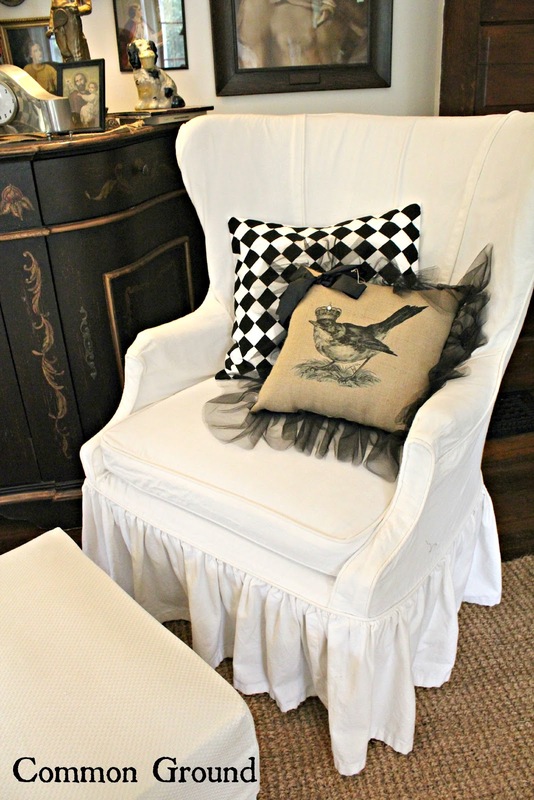 Love the high contrast of the black and white color scheme...so striking! Wow so beautiful. What a wonderful home. I love everything about her home. 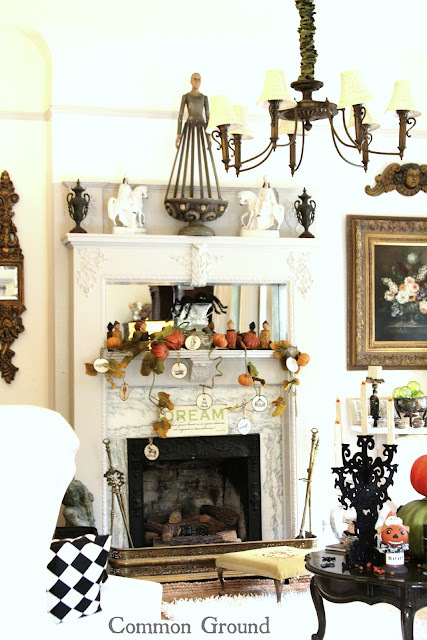 I love her beautiful home and fall decor. Cuteness! I'm loving all of your pillows so much! 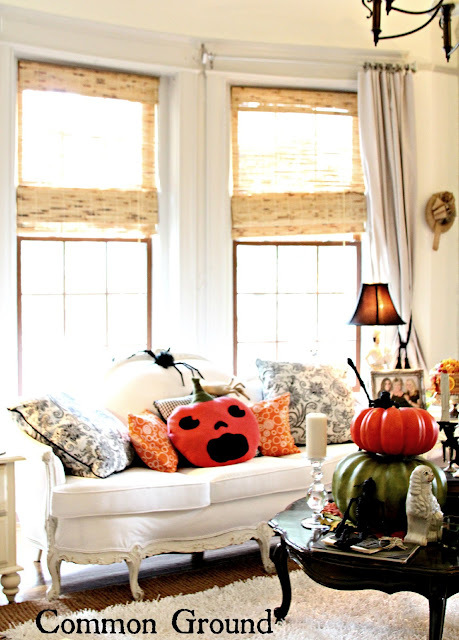 I never think to buy seasonal pillows but it looks so good. I need to do that! What a fabulously unique style she has. Thanks for sharing, Debra. Such a beautiful home with awesome Halloween decor! Thanks for sharing it with us! Oh...I love all of this. So spooky and pretty. 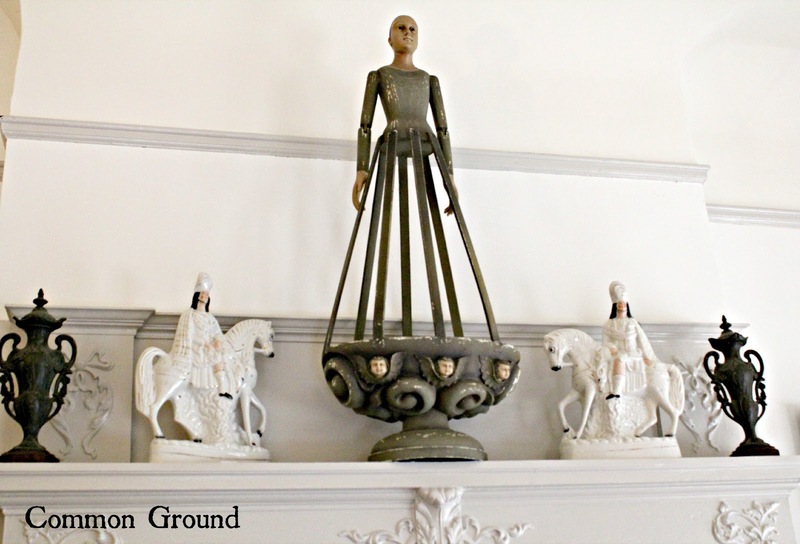 I am loving the mixture of elegance and spooky. 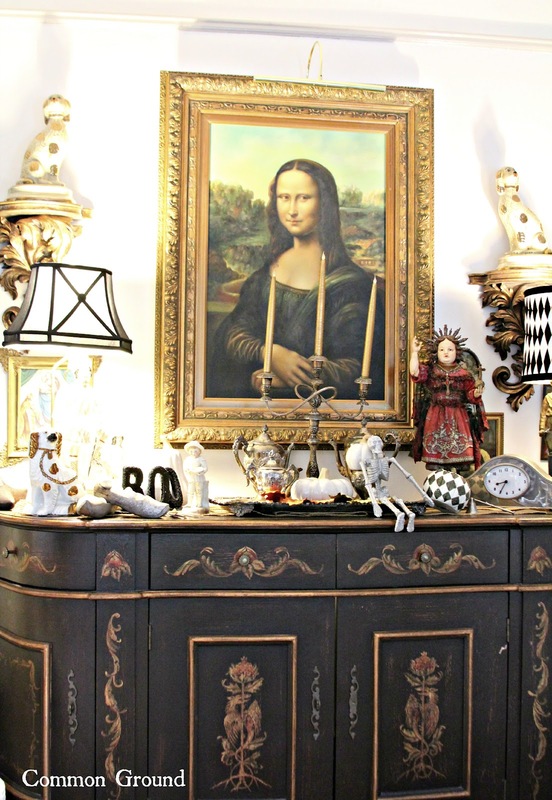 My favourite is the silver and the silver tray that was just beautiful. All of the photos are fabulous. Thanks for sharing! Debra, we will be in Missouri the week of October 8th. Maybe you could provide me with a list of "must see" shops?!?! Please?!?!? Would love to meet you! Oh, that fireplace all dressed up for the season is fabulous!! And all those pillows are just yummy! Thanks for sharing, Debra. I love old zip-mouth kitty with the carrot nose, how sweet! I can read that pumpkin pillows mind..... Please nooooo, nooooo, don't let Bliss sit on me, I'll be flat as a pancake. Beautiful home with truly great Halloween inspirations!! What a fun Halloween home you have. My weekly linky party--One Creative Weekend--has gone spooky this week in honor of my thirteenth party. If you haven’t already, I hope you’ll visit "One Creative Weekend" on OneCreativeMommy.com (open every Fri-Wed) and link up this idea and anything else you’d like to share. 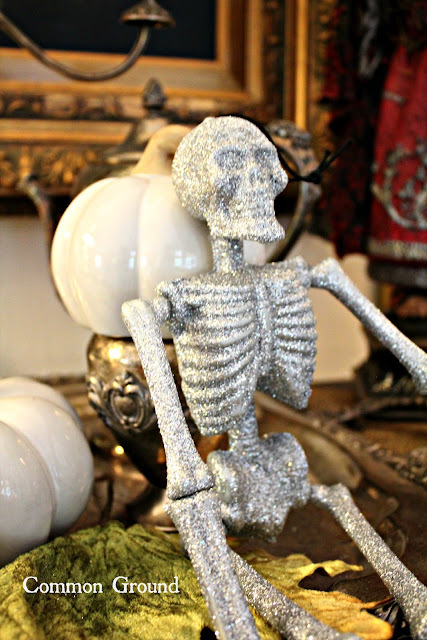 (You can include non-Halloween posts as well, but feel free to link up as many Halloween-themed posts as you like.) There are two categories—one for Halloween and one for everything else. What a fun friend. Her home is charming and all the Halloween decorations are just icing on the cake. 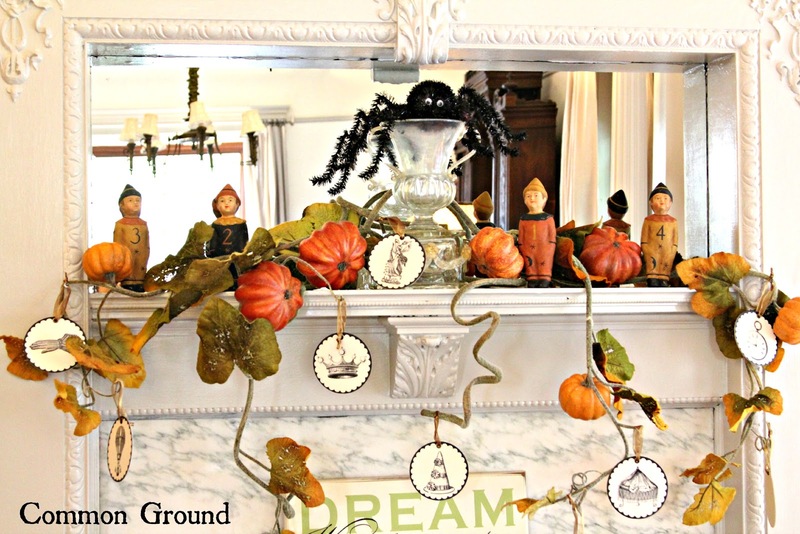 Lovely Halloween decor! 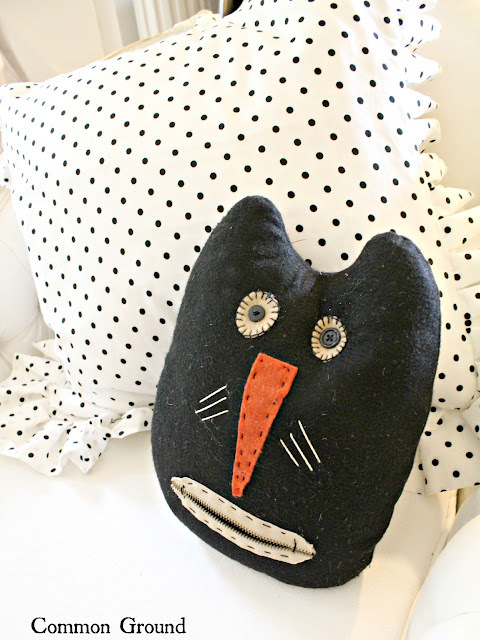 I adore the primitive cat pillow!!! Thanks for sharing!! !